We are pleased to be able to announce the availability of a new medium resolution optical survey created by Axel Mellinger. 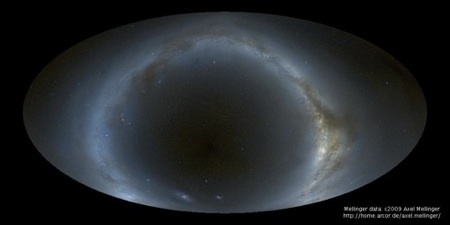 This three color all-sky survey provides beautiful large-scale true-color images of the sky. For regions less than 30 degrees, the resolution is about 0.01 degrees. For larger regions the data is sampled from 0.1 degree pixels. For more information on these data check out the survey web site. This survey provides an excellent complement to medium and low resolution surveys in other wavelengths, e.g., IRAS/IRIS and RASS and the new Fermi gamma-ray surveys that we plan on introducing in the next few weeks. Many thanks to Dr. Mellinger for allowing us to include these data in SkyView. The image above was created using the following arguments. The Mellinger survey is only available through the SkyView web site and cannot be retrieved using a local copy of the Jar file. The survey sets some defaults differently from other surveys. The default scaling is linear and the min and max values are set to 0 and 255 to preserve a consistent scaling regardless of the region you happen to pick out. We also set the ClipIntensive keyword when the Clipping sampler to preserve the scaling. This entry was posted in Announce and tagged All-sky, Mellinger, Optical. Bookmark the permalink. That is an unbelievable picture. It is amazing what NASA does because being a citizen on the outside, you only hear about things like the Space Shuttle. I am actually proud to be a tax payer at this moment. Keep up the good work here on this SkyView project, I’ll be coming back to see new pictures. I’ve bookmarked this site. Man all this space discovery technology just gets better and better.. I hope tp see more great images. THat is an amazing image, I’ve had a look at the otyher Mellinger images and there a lot of equally superb shots there as well. That photo is excellent. I can see many different uses for photos of this quality including some interesting wallpaper prints. Wonderful image. I just love outer space and was lucky enough to visit NASA in 2005. [link to commercial site deleted] Thanks! What an ABSOLUTELY INCREDIBLE IMAGE. Thank you NASA for you continued efforts. Images like this are enough to keep my 7 year old son completely intrigued with Space! Hello, is the SkyView RAID system working right now?? although I’ve seen no update on the blog regarding this, aside from the previous update posted. SkyView’s hardware was not directly affected by the recent problems. Some related systems had issues, including the server which holds the database used by our blog. wow, digital all sky mosaic images are amazing. Many thanks to Alex and your team for providing this very nice survey. This additional FITS header data would be most useful in processing Skyview images in my planeterium program HNSKY. The Mellinger survey will be available in the program from today. survey that start with integers, floating point outputs0 are possible. You are correct that with the default nearest neighbor sampling the user will only get integer values, but SkyView does all it’s computations in double precision. We could think about an option where the user could scaling to integers. Your idea that we put the actual range of the data in the FITS file makes a lot of sense. We already provide that in the web page output, so we’re already computing it. We’ll put that in the next revision thanks. You may wish to check with Alex Mellinger regarding use of his survey in your program. His data is not in the public domain. Don’t worry, I will not use the copyright protected data of the Mellinger survey directly but proving an interface to Skyview. The advantage of 8 bit or 16 bit FITS will be the smaller file size and therefore increased download speed. Also my excuse for the wrong spelling of dr. Mellinger firstname Axel. Car, Zea, Ait may be more appropriate for very large images. Copyright: Axel Mellinger. Permission is granted for use in research and personal, non-commercial use. Please contact Axel Mellinger for permission for other use. This copyright still applies even if you get the data through us.